Once upon a time I met a fellow blogger and we had an instant connection. Her name is Cassie and she is playful, lovable, sparky, beautiful inside and out and I could listen to her sweet accent for hours. We do our best at keeping in touch despite our distance, typically giggling at our sister-like bond. We are drawn to many of the same things, eat similar food types, have kids the same ages, select many of the same home decor pieces (rugs, mirrors, fabrics, etc...) and even have lightbulb moments at the same time! So imagine my eyes and cheek to cheek smile the day Cassie sent over today's contributing post (at the exact moment I was writing this week's Quick Tip Tuesday post). As you read on, you will understand our chuckles. 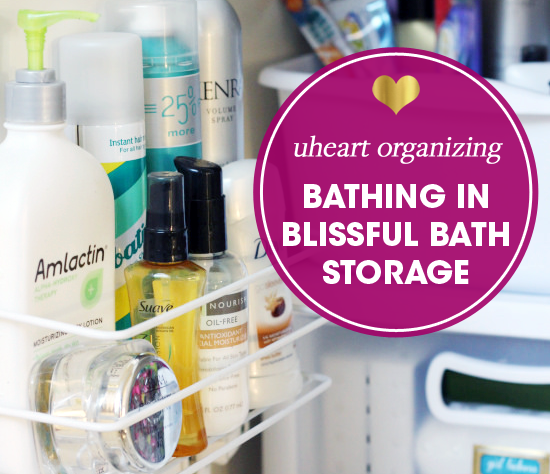 You will also find a ton of great tips for organizing a bathroom space. Say hello to the fabulous Cassie of Hi Sugarplum! Hello, hello!! 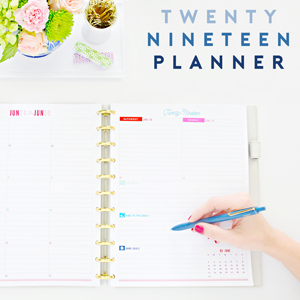 I'm thrilled to be back at Jen's today, sharing the latest organized space we tackled with you guys. A lot has changed since I was here last....we unexpectedly bought a house and moved! 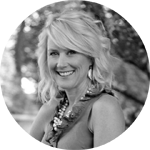 (Read about the whirlwind experience here, along with my tips on selling your home quickly.) Like Jen, we're renovating our Kitchen too, so I'm soaking up all her great tips and ideas. Isn't her Kitchen so fabulous?! 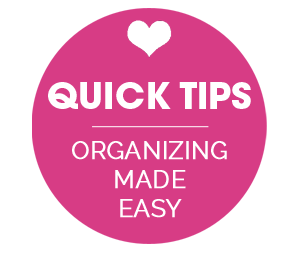 Having organized spaces in our former home made life run smoother, and turns out, so much easier to pack and move, since I didn't have to spend much time purging and sorting. The downside is our organizational systems didn't transition as well to the new house because the layouts and space are completely different. But any dedicated iHeart fan knows I'm secretly loving the opportunity to start over and adapt to each new space... starting with the Master Bathroom cabinets and drawers. 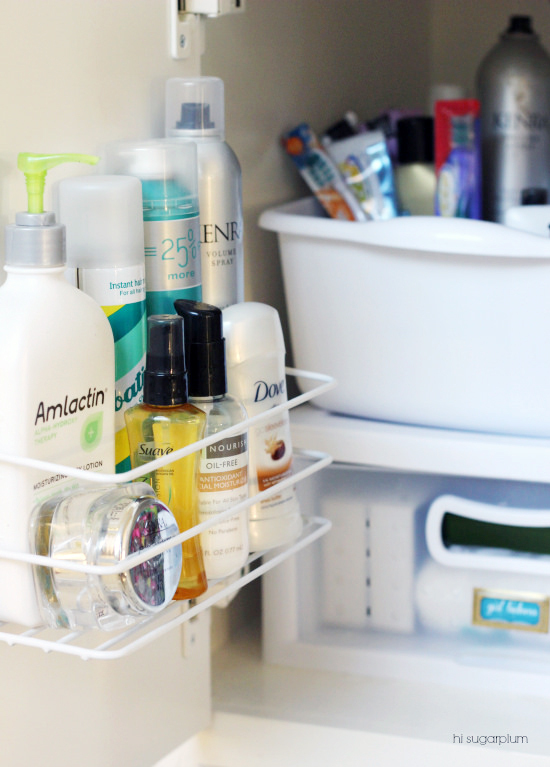 I prefer to keep the counter fairly clear, so that puts all the pressure on the cabinets and drawers to hold all of our daily 'bathroom essentials.' Mr. Sugarplum and I each have a single cabinet, and we share a bank of three drawers, so we have to get every ounce of potential out of them! Our former cabinets allowed for a stack of these modular drawers, but thanks to the plumbing and door placement, only one fits in the new house...so door storage to the rescue! These wire racks are available everywhere (I found them cheapest at Wal-Mart), and since our cabinet doors are solid wood, I was able to screw them in. Just make sure the screw is shorter than the door! #oops If you aren't able to drill, you can still utilize door space using this method with removable hooks. This side holds all my nail polish and accessories. I like that it limits me to only what fits in the dedicated space...keeps me from over-accumulating! 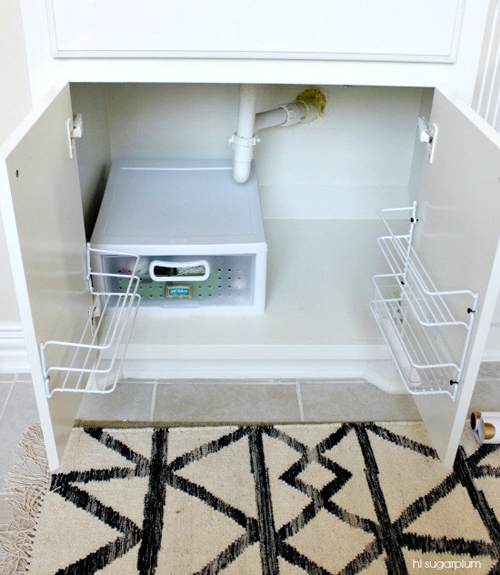 You'll need to consider several things before determining rack placement...make sure the door will still close, both in the hinge area and inside the cabinet, and allow enough room for your tallest product. Also, double-check that everything in the cabinet is still accessible, and any drawers will open fully. 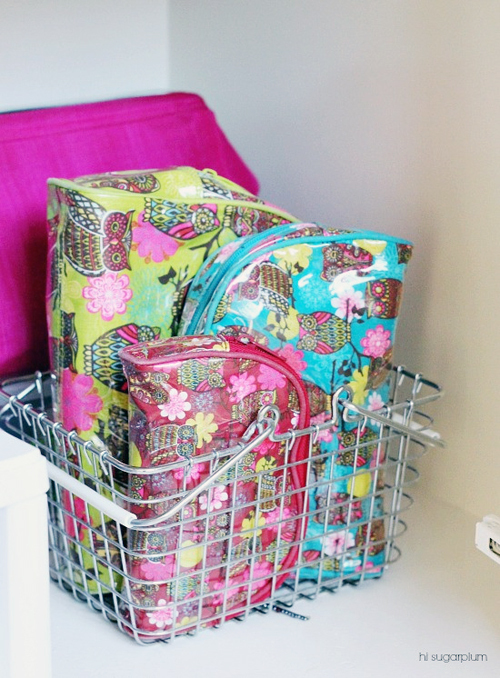 I used the pull-out drawer to store smaller items, and things I don't reach for as often. The tub holds back-ups for the stuff I buy in bulk, so I check there before shopping for replacements. It's not a pretty picture by blog standards, but it still makes my heart flutter! 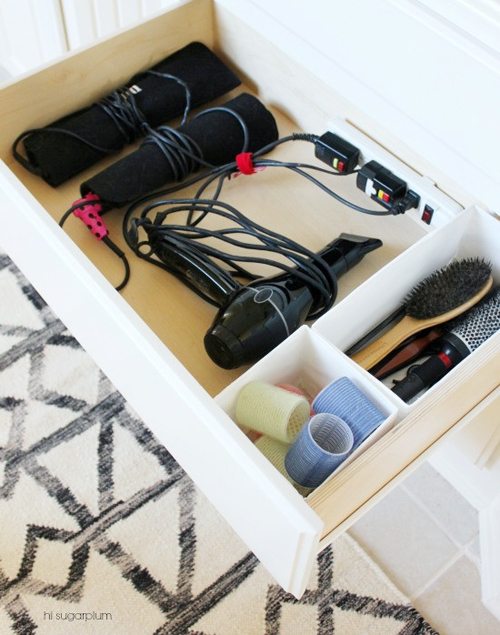 You're probably wondering where all the makeup and hair tools are...so let's move over to the drawers. First thing I do is line them with protective paper...but I always have a hard time finding ones I like (that are affordable, anyway!). 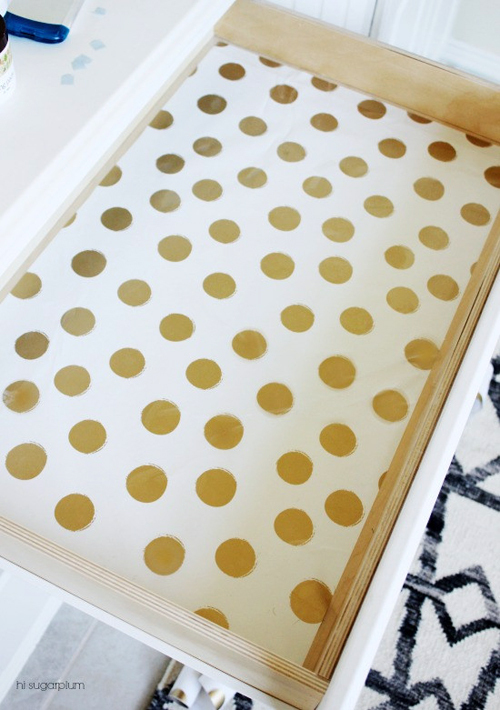 So I've come up with a way to create wipe-able drawer liners out of any decorative paper! You ready for my light bulb moment?!?! All you need is your paper of choice, and a roll of clear contact paper! First cut the contact paper to the drawer's dimensions. Then cut your decorative paper (I used wrapping paper from Target) slightly smaller than the contact paper. Lay it in the drawer first (I used sticky squares to hold it in place), then seal with the clear contact paper. Bam! 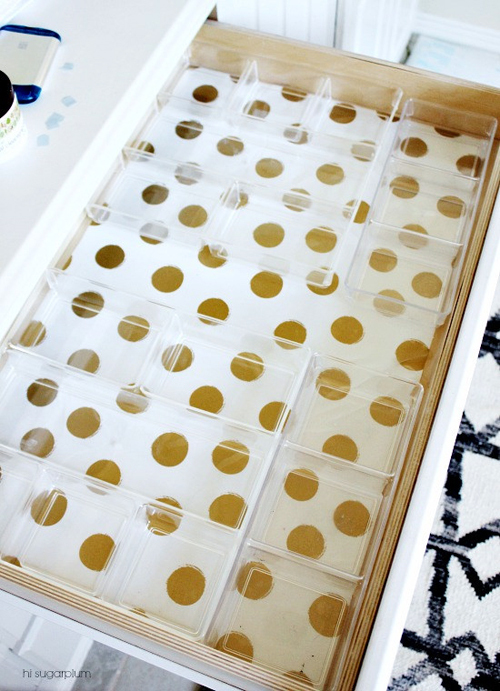 Custom wipeable drawer liner! The only downside is you can't peel it up and reapply, so go slowly! 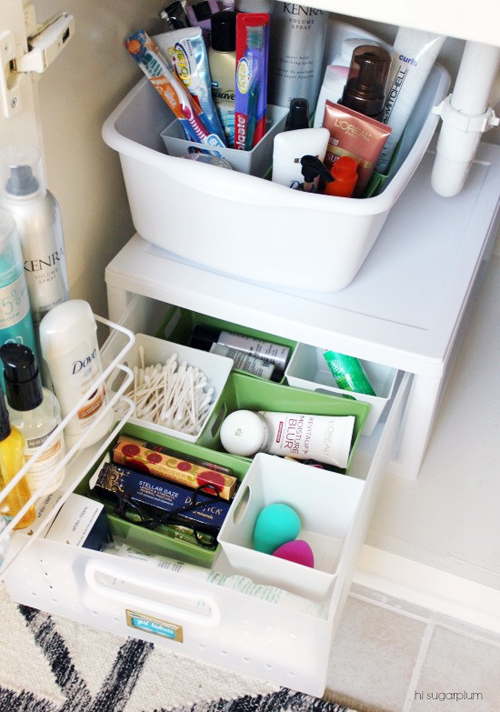 Clear plastic divider trays are my favorites for bathrooms because they don't add visual clutter, and are easy to wash.
Clearly we're a house divided when it comes to toothpaste brands...so I created a his and hers side, filling each compartment with all the daily essentials. And my counters stay blissfully clutter-free! Love that Cassie! You two are cute together!! Looks great Cassie. 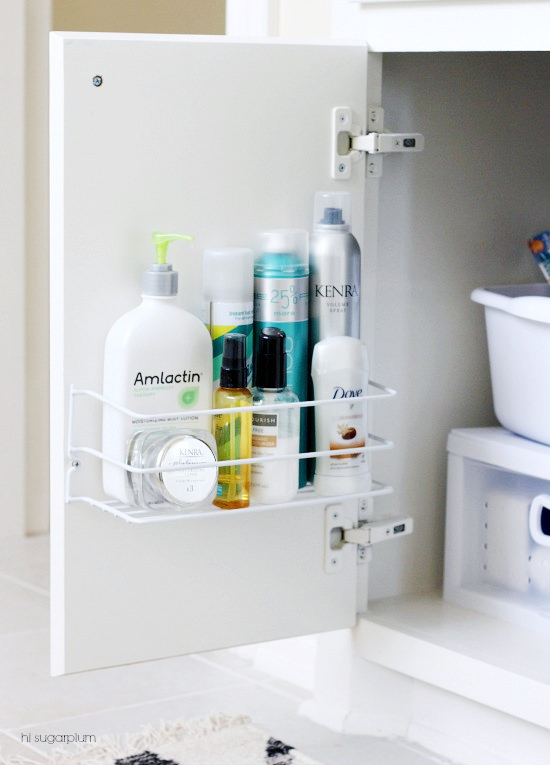 The Container Store has clear stackable shoe drawers (two sizes) that work in bathroom cabinets that have plumbing since they are not quite as wide, and I love that they are clear and I can see everything. Yes ma'am! Love their clear bins! I prefer no lids for cabinet storage of things I need to get to to daily though. Wow! 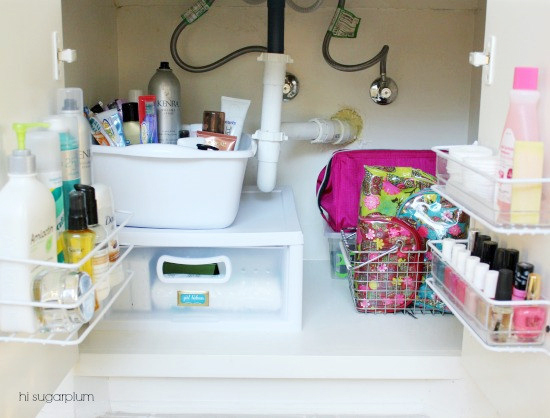 I've been looking for tips for organizing my bathroom, this was just what I needed. I love the idea of the paper in the drawers, very pretty! 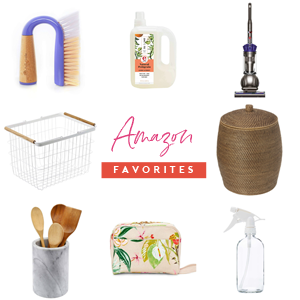 I'm SO happy to see this post, both for the ideas AND because it reminded me to go to plumbsmartdesign.com to buy one of their Pipes Away Plumbing kit! 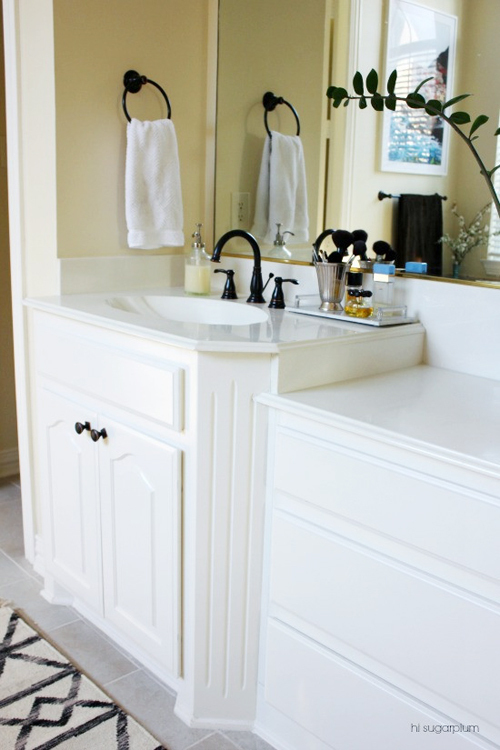 We're currently renovating our powder room and we're shooting for an open sink base, so I was thrilled to see this kit advertised at sawdustgirl.com. Maybe somebody else can snag some of that storage space the pipes eat up! Thanks for the tip, Wendy! I'll check them out! I love this post!! So many great ideas…we are moving to a new house soon so I will definitely keep them in mind. Yay! Glad to hear it, Peggy...and good luck with the move! 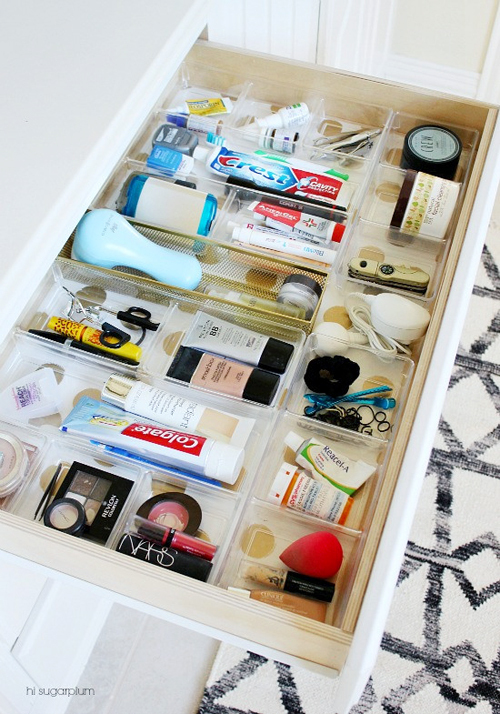 Wow....so many great ideas!Everything is so organized!Thank you for the post, i've beenk looking for some ideas to organize my bathroom drawers! I love Hi Sugarplum! 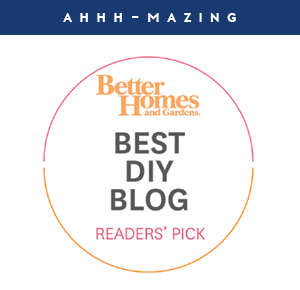 Your's and Cassie's blogs are THE two that I follow everyday! I'm with Peggy! These are great ideas! Cassie! I just looked at your Friday Five and popped over to Jen's blog only to find you there too! No wonder your posts were down one this week. ;) I love it when you girls collaborate. Love the new bathroom ideas. 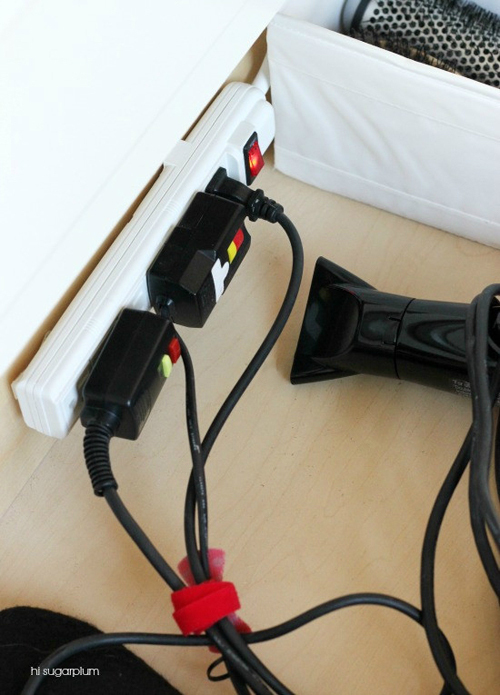 That power cord is genius. Ha!!! Yes, life got crazy this week! But I wouldn't miss a chance to collaborate over here! Happy weekend, Erin! I love that you took cute wrapping paper and covered it with Contact paper. 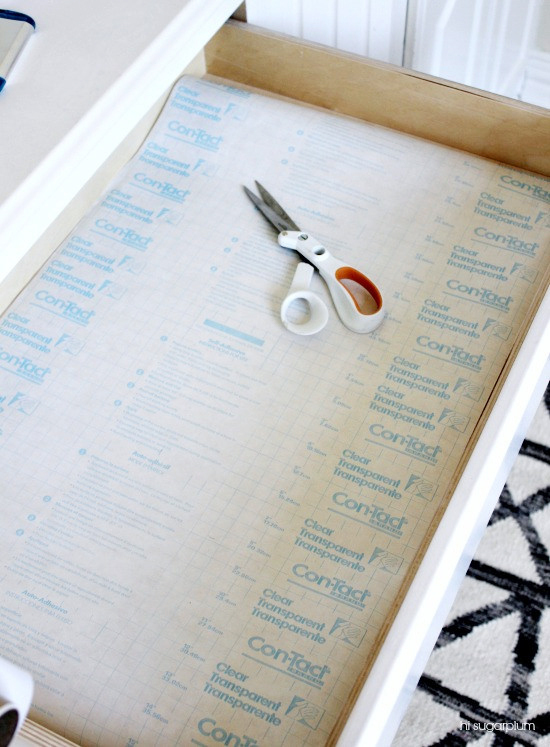 Contact paper is the best and your drawer looks beautiful! Pinned! Where do you get the clear plastic divider trays? I'm heading over to check out your blog! Beautiful bathroom! Elisa...I got mine at Target, but I've seen them on amazon and container store, too! Looked at Target today, couldn't find them. What department were they in? Do you remember the brand? Thanks! Love the wrapping paper trick! Thanks, girlie!! It's a runner from West Elm....currently on sale, I think! How beautiful and inspiring! I'm off to work on mine! Thanks so much for sharing. 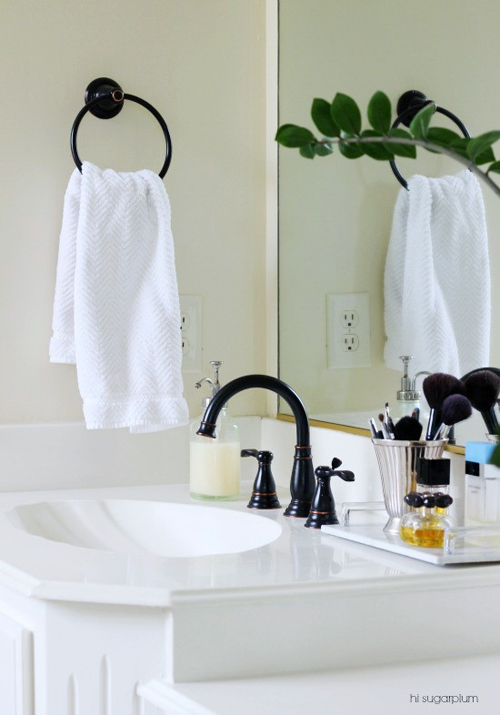 Thanks for sharing these ideas for an organized and beautiful bathroom! 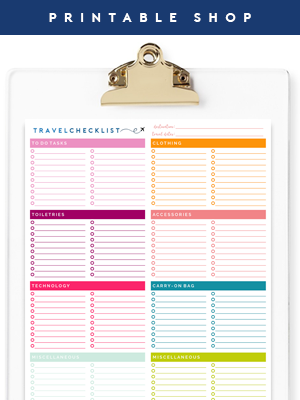 I struggle with easy organization in there, sometimes, so this is great! I love the outlets in the drawer!! That would be so useful. I have a tiny bathroom and even charging my Clarisonic takes up too much space. 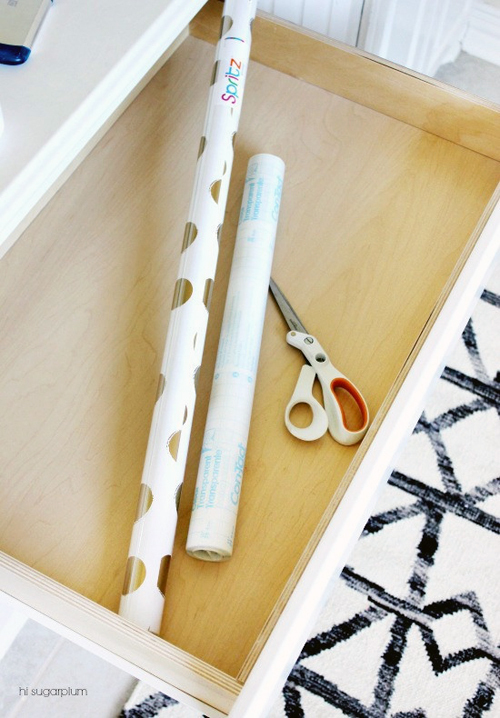 I've always used patterned contact paper, but I love the idea of expanding my options with wrapping paper. This one in particular. I can't decide what I love the most, the wrapping paper, the appliance drawer (fabulous idea) or those beautiful clear containers. Perfect organization, all around!!! I love that drawer with the gift wrap inside! Such a simple but gorgeous idea. 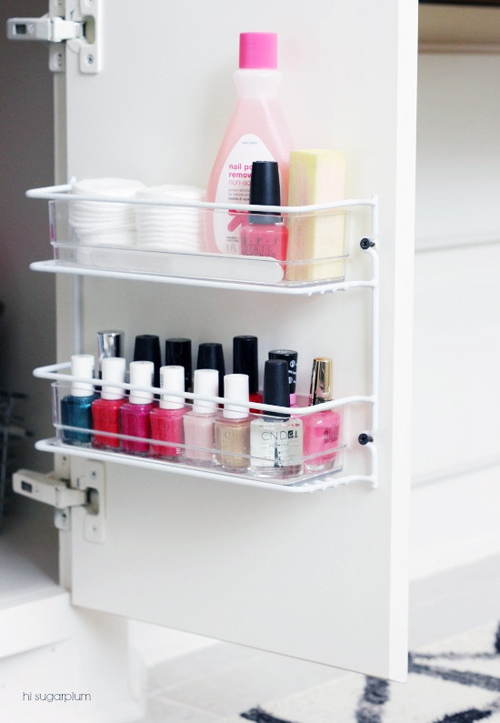 Gonna have to try that in my own bathroom - my drawers could use a little more pizzazz. 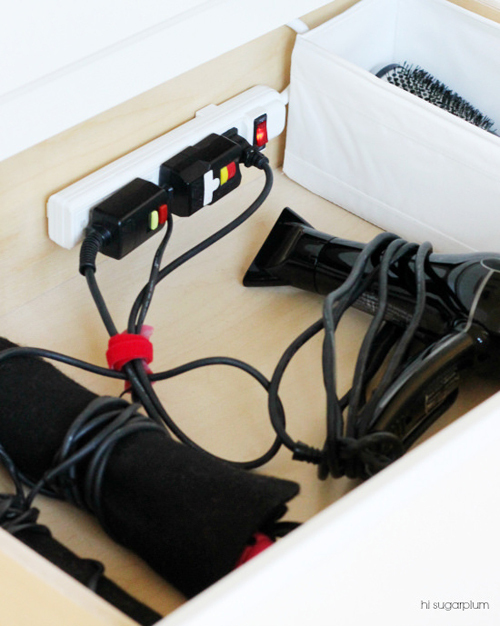 Love the idea of putting the cords in the drawer. Did you have to customize the drawer to fit the power cold in it? Love love love!!! I'm the same way about clear counters!! In the kitchen too!! Love these ideas, always wanted to line the inside of my draw's but never knew how to tackle it. Also I'd tried other divider thingy's but yours are way better. Thank You for this! I have been in need of organizing our bathroom and have been looking for ideas! Love these! This is so creative, I never thought about contacting gift wrapping paper. I always felt so limited by the choices of contact paper print, but this adds so much choices now! Thankyou.